Located on scenic ridge overlooking Putnam Park and the Chippewa River on upper campus, Chancellors Hall is an apartment style residence hall for upperclassman. Not only is the building equipped with computer labs and an elevator, it is near softball and soccer fields for you to use at your disposal. Living area size: 21' 10" x 10' 5". Individual room sizes are approximately 8' 3" x 10' 5"
*All floors have the same layout. Example 105 represents location of 205, 305, etc. 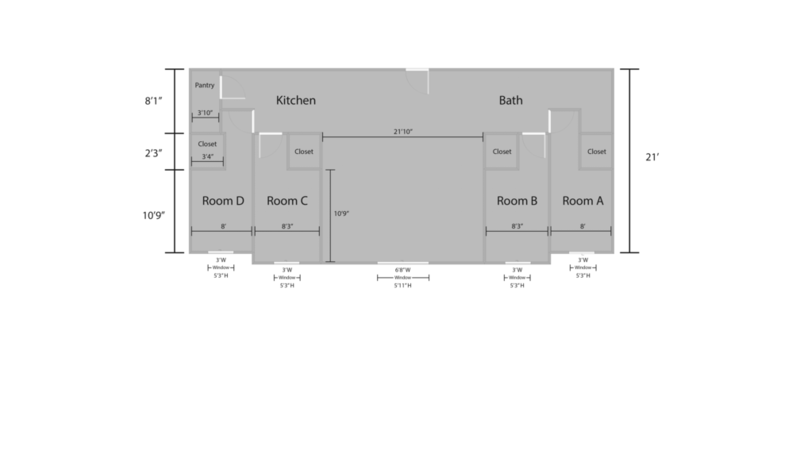 **Provided room dimensions is for a typical room layout in the designated building. Room sizes may vary. Large Bookcase 24" 24" 30"
Small Bookcase 27" 40" 80"